The function of this device is to connect up to 8 PWM devices (fans and/or pumps) to a single PWM fan conector on the motherboard, thus enabling speed-control of all connected PWM devices concurrently. 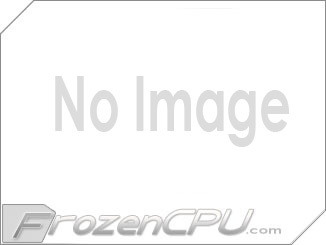 We generally recommend to use the “CPU_Fan” connector of the motherboard,because most motherboard manufacturers usually allow a greater range of adjustments on this particular connector. PWM capable connectors must necessarily be 4-pin, but not all 4-pin motherboard connectors implement or enable the PWM signal modulation by default. Please carefully consult your motherboard documentation in this respect. 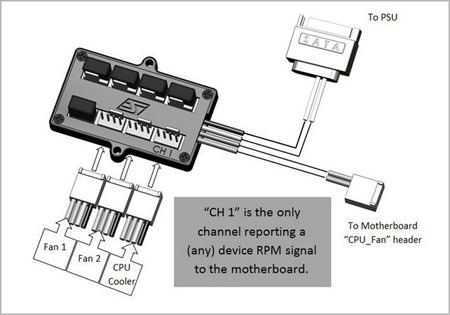 Since only one RPM signal can be read by one motherboard connector, only channel 1 of the PWM splitter carries an RPM signal; thus the motherboard will only read the RPM signal of the PWM device that is connected to channel 1 of the splitter. The PWM signal cable has 2 wires: 1 for the PWM signal, and 1 for the RPM signal. Power to the PWM splitter is supplied by a SATA connector that must be connected to the Power supply.